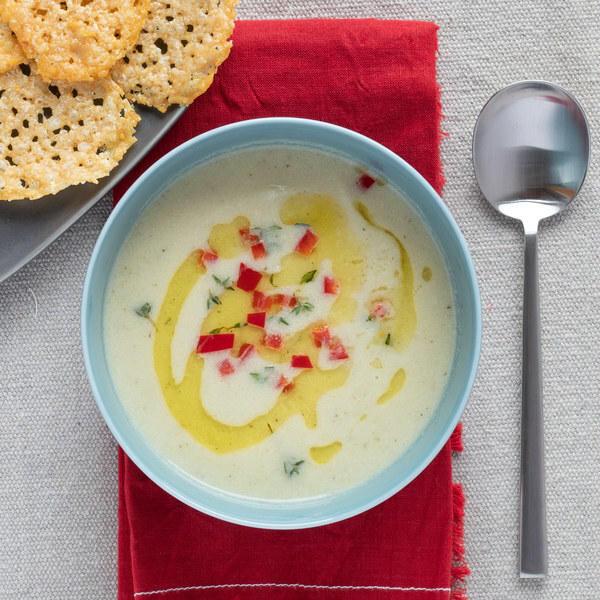 ← Cauliflower Bisque with Fresh Thyme, Red Pepper & Parmesan Crisps. Cut off the cauliflower leaves. Roughly cut into florets and cut the thick stems into smaller pieces. Peel and mince or press the garlic. Holding the thyme at one end, slide leaves off the stems; discard the stems. Heat a large pot over medium heat. Add butter and warm until butter foams, about 1 minute. Add garlic, salt, pepper, and half of the thyme. Cook, stirring often, until the garlic begins to brown, 4-5 minutes. Add the cauliflower and the broth to the pot and cover with a lid. Cook until cauliflower is fork tender, 14-18 minutes. Grate Parmesan cheese. Line a baking sheet with parchment paper. Measure out 1 tbsp of the grated Parmesan and place in a pile on the sheet. Repeat with remaining cheese, keeping the piles a few inches apart. Place in the oven and bake until lightly browned, 5-7 minutes. Watch carefully because they can burn quickly. Once done, remove from the oven and let them sit for a couple of minutes. Cut the bell pepper into quarters lengthwise; remove and discard the seeds and white membrane. Finely dice the pepper and set aside. Juice the lemon and add to the pot. Puree soup until smooth using a hand or regular blender. Turn the heat down to low and stir in a ½ cup of cream. To serve, spoon the soup into bowls and garnish with olive oil, red bell pepper and thyme; arrange Parmesan medallions on the side. Enjoy!